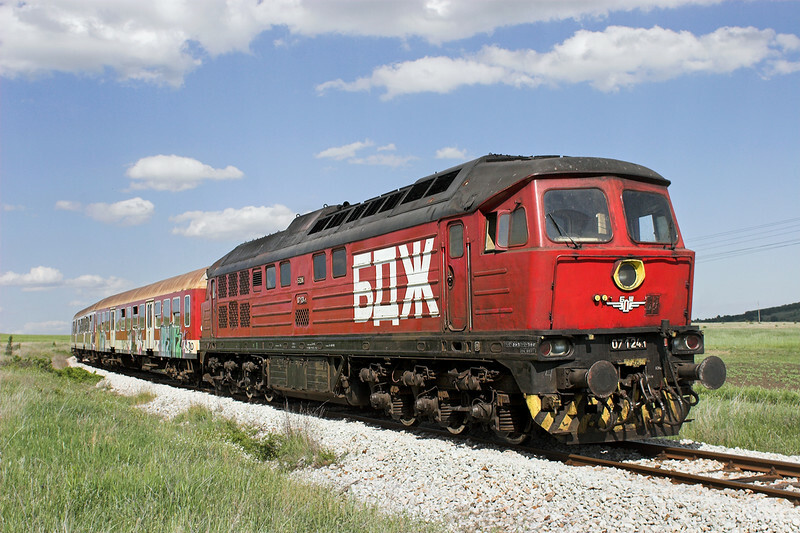 Welcome to another Railwaymedia blog, number 43, covering a five day trip to Bulgaria. An annual trip with a few friends to somewhere in Europe seems to have become established now, any extra trips I can get away with like that to Düsseldorf earlier in the year are a bonus! Bulgaria had been considered for the past few years as a destination, due primarily to the presence of the ex-British Class 87's over there running for the Bulgarian Railway Company (a private company, not the national operator), but the sparsity of the rail services and the lack of information on where to find things had put us off slightly. We decided anyway to bite the bullet and go and I think it paid off, though due to the lack of trains I would highly recommend car hire as the way to get around. We stayed in Sofia in the Hotel Lion which is a short walk from both the Railway Station and the City Centre. Centrally located it was reasonable priced too, though if we had known we were going to be driving we would have booked elsewhere; most of the photography we did was between Pirdop, Plovdiv and Velingrad about 100km from Sofia so a base that way would have saved time. The car was hired through Europcar and for 5 days the Kia Cee'd was £210. All in all with petrol it probably cost each of us about £90 after it was split four ways. Under 2 hours after landing at Sofia Airport myself and Tim were at Pirdop which is the main base for the expatriate 87's, and indeed the first shot of the holiday was that one above of 87010. In the four quick visits we made to the place we saw maybe 9 or 10 different examples of the class, and even had a ride round the yard in the cab with one of their friendly drivers. Note however that hardly any rail staff in Bulgaria speak English, although in hotels and restaurants it is widely spoken so certainly not a problem in big cities. We headed afterwards down to the main Sofia to Plovdiv line at Vakarel to meet up with the other two of the party. I had researched a few locations on Google Streetview before leaving Britain which helped; everywhere we went was as a result of either this research or lucky observation as we drove around. 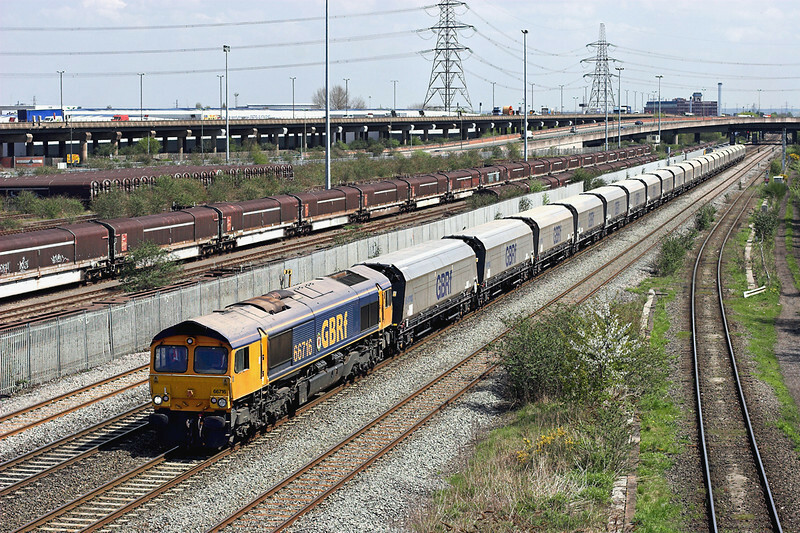 Even though it is one of the three mainlines across the country, it is not exactly busy and in several hours there we only saw one freight, a couple of units and three loco-hauled trains. Day 2, and we headed east past Pirdop to the lovely village of Klisura. At the head of a valley, the railway line here does a spiral to gain height, so passes twice through the village across a couple of high viaducts. It was a lovely place to wait but, with the long gaps in the service, it was three hours before the first passenger train appeared. 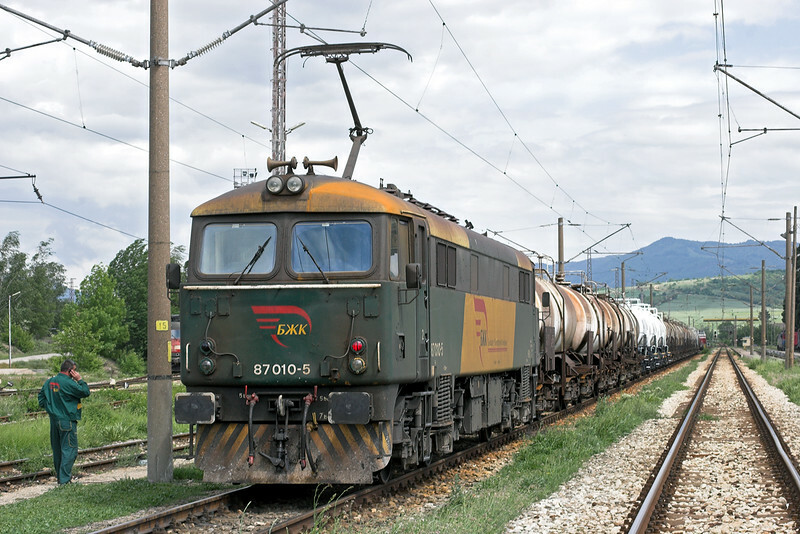 You really do need to know when freight trains run as there is no point just sitting somewhere and waiting for one to turn up like you can do in most of the rest of Europe. 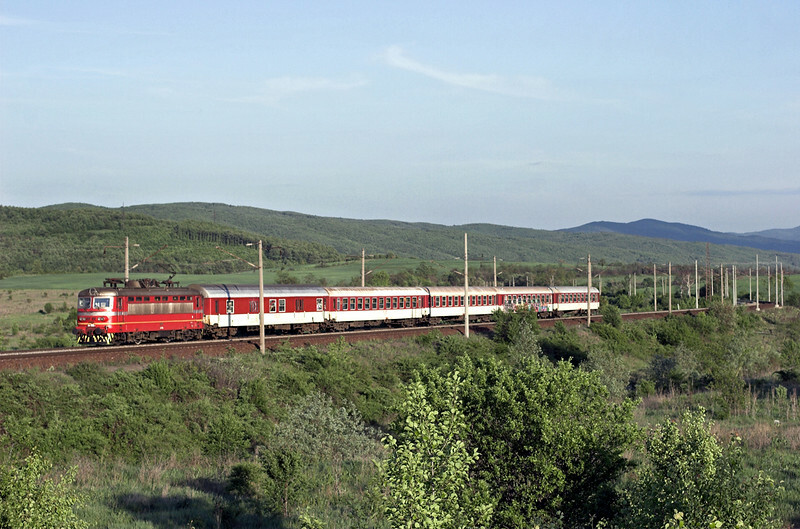 The two midday passenger services are meant to pass at Klisura but the westbound one, the 0850 from Burgas, seems to be one of several long-distance trains that consistently run at least 30 minutes late, so the light wasn't quite right for it when it turned up. It is also the only train we saw hauled by a Class 46 Electric, all of which appear to be in a non-standard blue and orange livery. The second day proved to be the quietest of the trip with only seven pictures taken all day, almost half of which were of the 1355 Plovdiv to Panagyurishte and 1610 return. 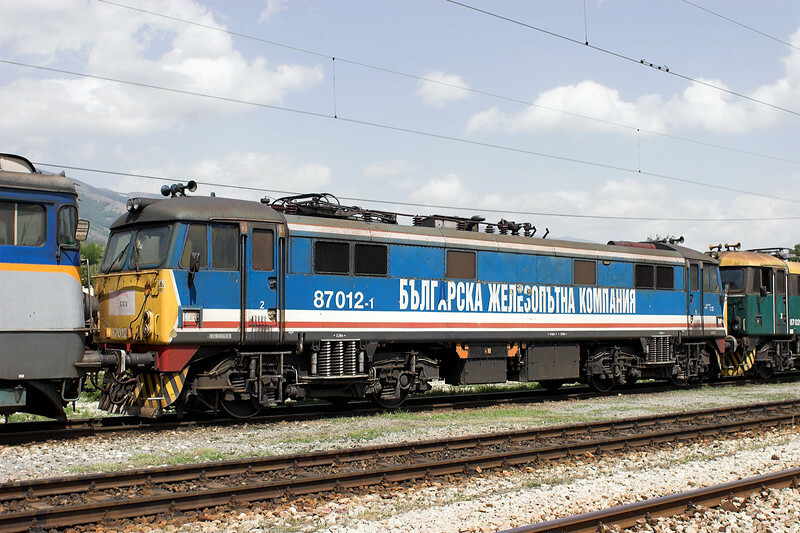 Whilst in theory all the local branch services from Plovdiv are operated by Siemens Desiro DMU's, a shortage at the moment means some on this line, and the one to Peshtera, are being operated by Class 07 'Ludmilla' diesels. The Panagyurishte line is quite good for 'car chasing' the train over the northern section, which we did on three occasions (on Thursday the train was formed by a DMU). 07124 was the engine on the Wednesday which we photographed once heading uphill and twice coming down (picture at top). 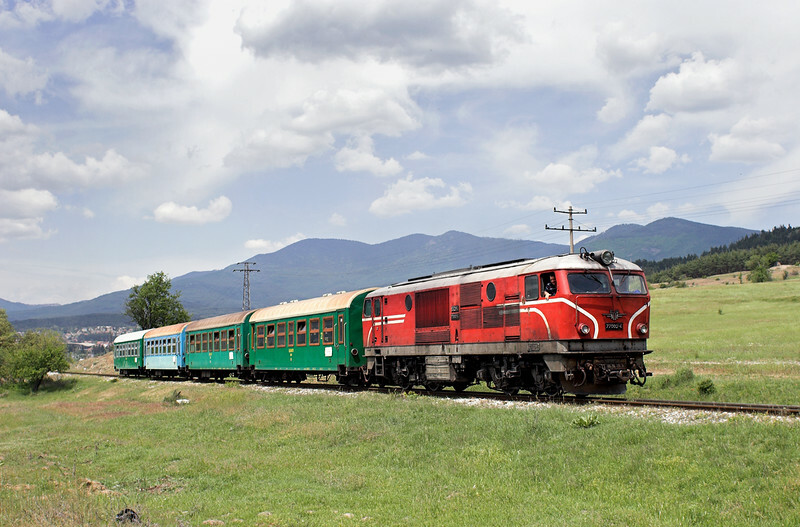 Following this we called into Septemvri on the Plovdiv mainline to see the 1822 narrow gauge departure to Velingrad. 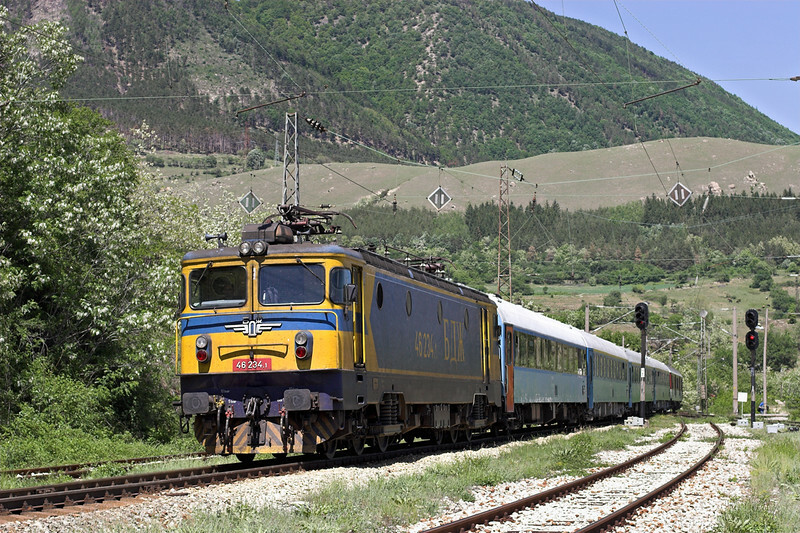 This line runs through to the ski resort of Dobrinishite and is a marathon 4 hour journey with three trains a day (plus an extra to Velingrad about one hour up the valley). 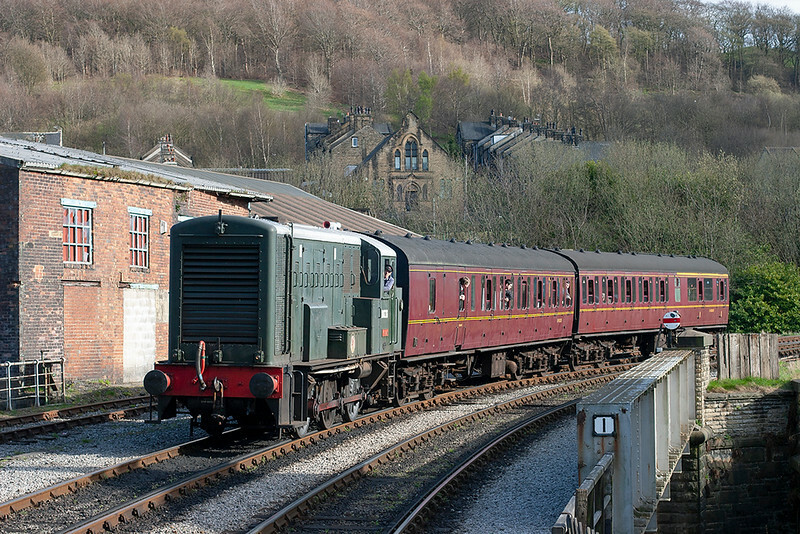 We returned to this line on Day 3 to get photographs of all three trains in use. It is very easy to chase the train up the gorge towards Velingrad and we got thirteen shots of the three morning workings. 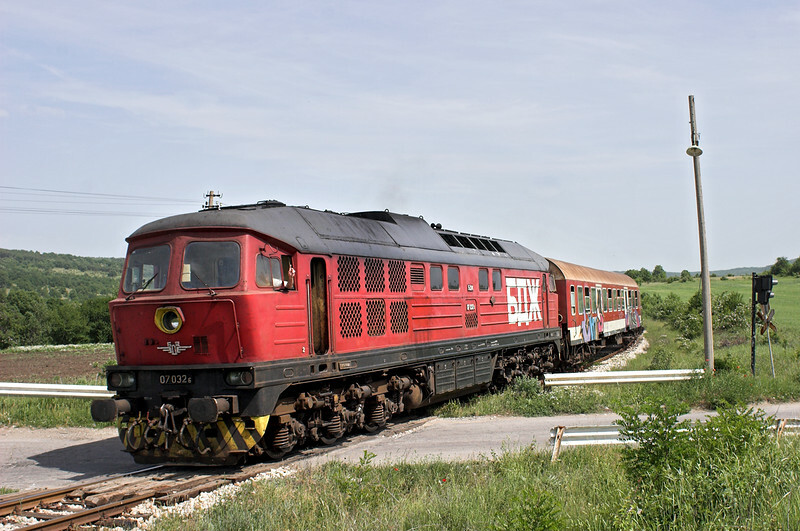 Two were hauled by Class 75 Henschel locomotives dating from 1965 and the final one by a more modern Class 77 built in Bucharest by Faur in 1988. 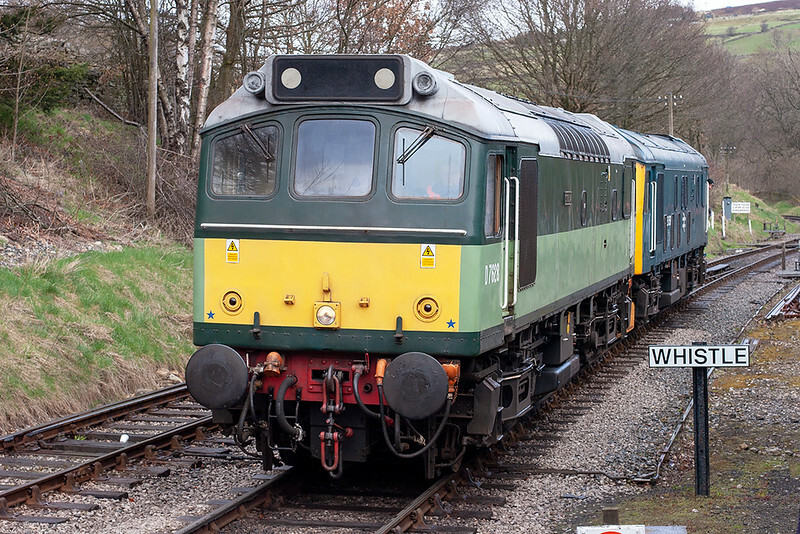 (Faur also built the German DR Class 119 diesels). The day was finished off on the mainline at Stambolovo, the only afternoon of the trip it wasn't sunny. This has to be one of the most run down stations I have ever seen, we weren't sure if it was actually the station anymore, but a pair of Desiro's did stop. 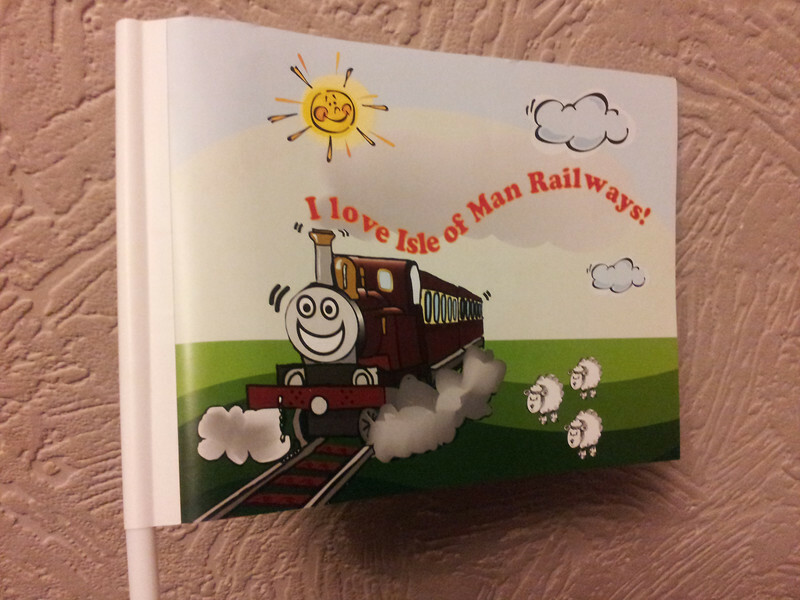 Unbelievably it has thirteen departures each day! I got Tim to drive back to Sofia and he kindly went to the shop in the village, so the owner made a sale of 8 bottles of beer to probably the only Englishman they have ever served! Day 4 was more or less a repeat of Day 2 in that we went to Pirdop before chasing the Panagyurishte 07. Instead of going to Klisura first though we headed up the Iskar Gorge. 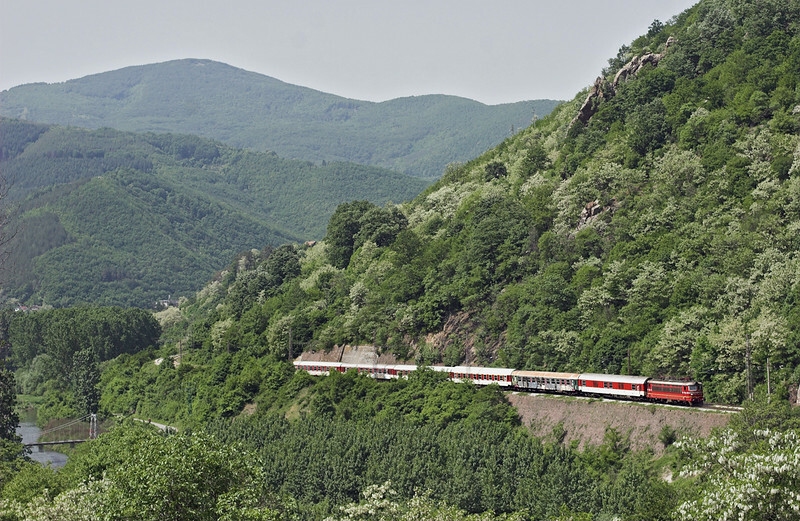 The northern mainline to Mezdra passes through this long gorge and we found a location north of Svoge giving a view across to the line. The valley is heavily wooded so clear shots of trains are limited. We were a bit unlucky as we missed a northbound train as we were crossing a precarious wooden suspension bridge across the river and several more trains headed south which was the wrong way the shot we had chosen. Driving anywhere around Bulgaria takes longer that it seems from the map, Tim bought an OS-style map which was invaluable. A two hour drive from Svoge got us to Pirdop which this particular day was quiet with the two Class 87's present parked inconveniently for photographs, though a shot of Network South East liveried 87012 complete with its new Cyrillic script had to be taken! Back to chasing the 07 and a different engine produced a lovely shot as it climbed out of Strelca (below). This location is situated very conveniently by the main road to the west of the town. There is a 30 minute or so wait whilst the train goes to the end of the line and back which allowed us to find a different location for the southbound working. The line more or less parallels the minor road south from Strelca towards Pazardzik. 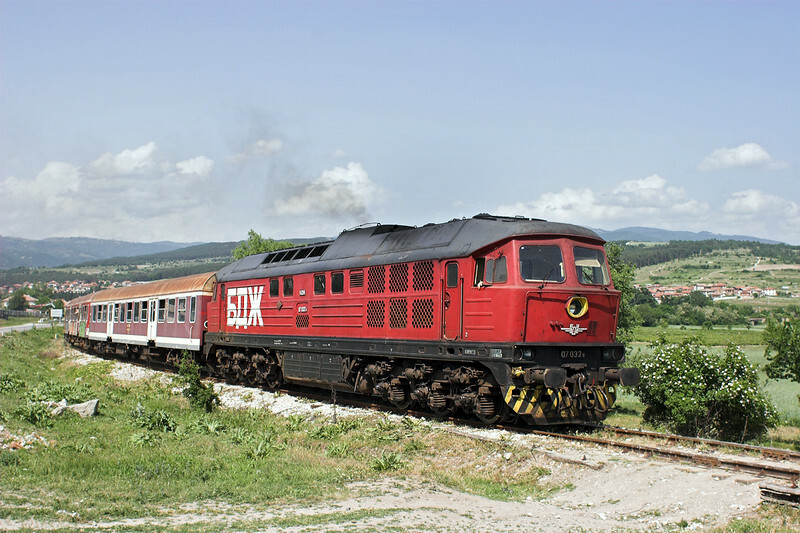 There are crossings in the village of Dyuelvo and near Smilets where shots can be taken; from Smilets to Ovcepolchi the road is far more direct than the railway so you can easily beat the train to the crossing there, although the sun is just off the front of the loco. 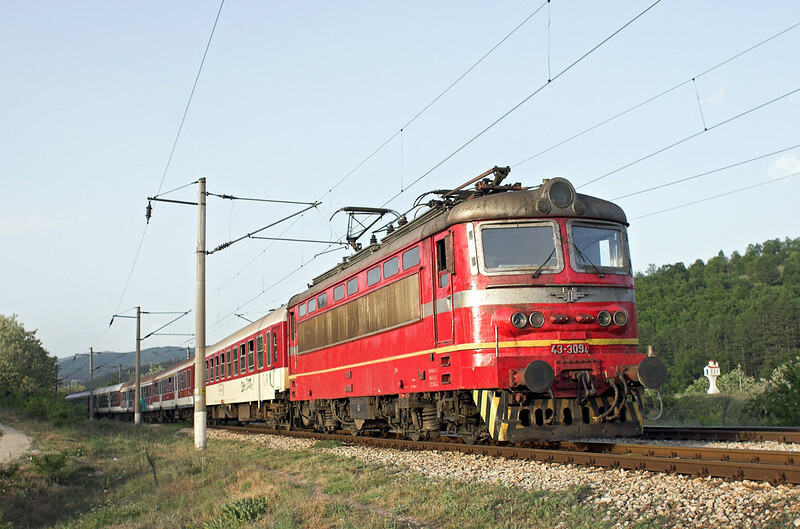 We ended the day once again on the mainline near Kostenec. There is a layby just east of the village and by nipping across the tracks there is a good vantage point in a field for evening westbound trains. 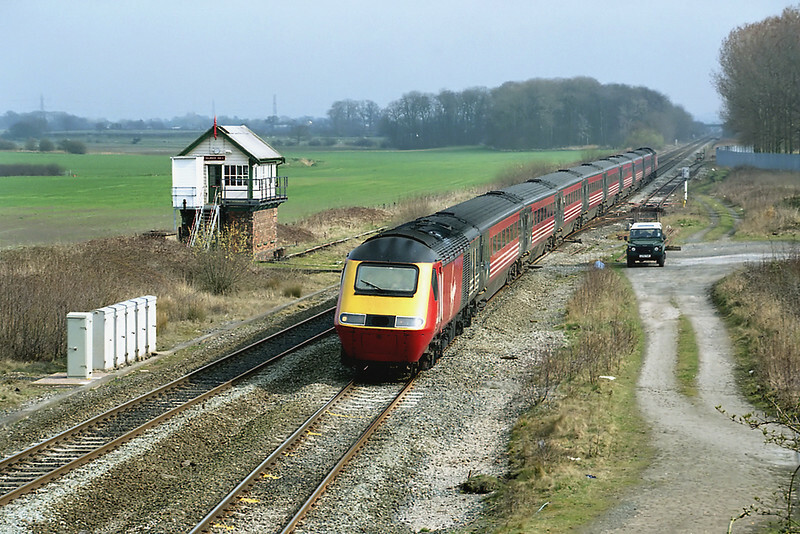 There is a loco hauled express from Burgas at about 1810, but this is another of the regular late runners which often follows the next Desiro worked stopping train or even the loco-hauled stopper after that. A quick stop on the other side of the town where the line curves enough for a shot of trains heading the other way. Before we headed back to Sofia we had time to photograph the 1830 from Sofia which normally has a sleeper coach added on the back which goes through to Istanbul. We ended the day meeting a friend who lives in Sofia but who used to work in my 'local' pub whilst studying photography in Preston. All week we had ended up in the Happy Bar and Grill for our tea and a few beers. Pretty basic food but easy enough after a long day out photographing. Antoni took us up to the hills to the Riverside Brewery on the slopes of the Vitosha Mountain overlooking Sofia. An excellent last meal of the holiday and no way would we have found it without him! Since the horse meat 'scandal' here in Britain I've been wanting to try a horse meat steak and I must say it was very nice. I can see why it has been used to substitute for beef as it has a very similar taste. The final day we decided to have two hours photographing trams in Sofia itself. There is a great range of tram types and liveries, some have come second hand, we saw a few still in Leipzig LVB livery. There is also a new Underground Metro system too. 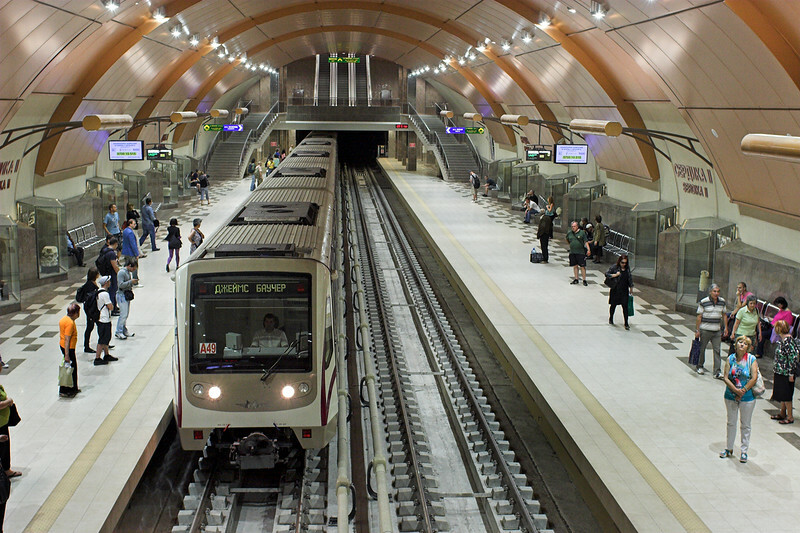 Line 1 opened in 1998 and Line 2 last year. 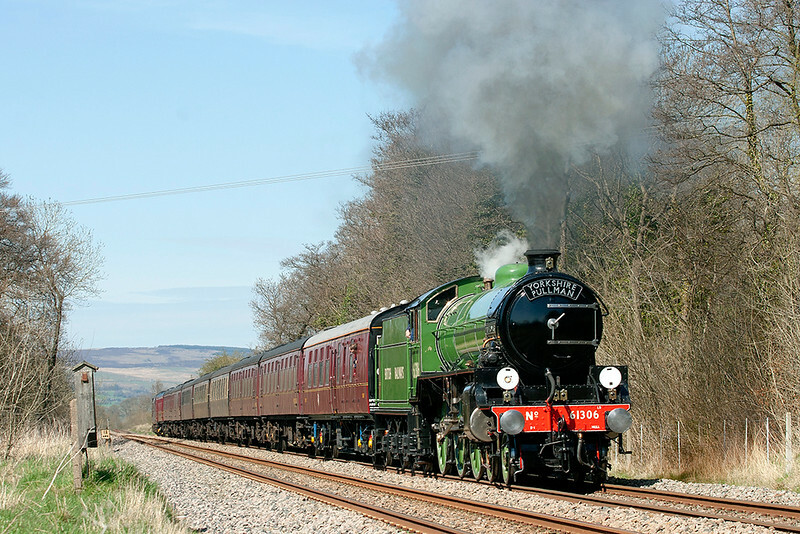 Like most systems abroad it appears to have been built to a high standard; there are two types of trains, one type built for each line, although as they both lines now link at one end they are a mixed fleet operating on both. Frequencies are about every 7 minutes and there is a flat fare of 1 Lev (under 50p). There are plans to extend it through to the Airport which will be a welcome move. With our flight back to Manchester not until half past 9 in the evening we had pretty much another full day available so, as usual, headed to Pirdop. There were four Class 87's present, 87020 nicely lined up for a picture in the sun. 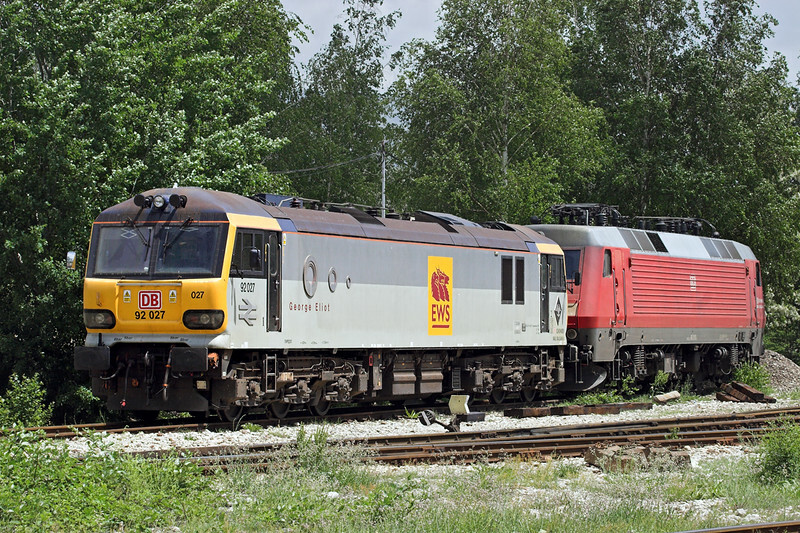 All week there had been two of DB Schenkers Class 92's (92025 and 92027) parked on the far side of the yard behind an ex-Danish Class 86. Allegedly DB don't like you photographing their engines in Bulgaria, but with 027 gone and 025 moved into a photographable position I was able to get a shot from behind the rakes of wagons on the BRC side of the yard. There seems to be no real reason for hanging round Pirdop in the afternoon so again it was back to the Panagyurishte line for the final shots of the holiday. To say that 07032 was clagging well was an understatement, however the driver always seemed to manage to open up fully just after he had passed us and the thick black smoke emanating from it always occurred just after pressing the shutter, despite seven attempts! How long these Ludmilla's will continue working this train I don't know, but I am certainly glad we made the effort to get to the country to photograph them. I hope this blog will be useful to anyone planning a visit to Bulgaria, I think we were generally lucky with the weather as I understand it can be quite changeable even in summer. Most afternoons it started clouding up over the mountains and was always better towards the Plovdiv area rather than further west towards Sofia. Driving is pretty easy once, like anywhere, you get used to the unofficial rules of the country; food and beer is pretty cheap and there is still a good range of engines to be observed, providing you have the timetable to work out when they are due! I've included through the blog the links to each days photographs, but they can all be seen in my new Bulgaria album HERE. Thanks as always for taking the time to read this, I'll leave you with a picture of the rest of the 'gang' on location in the Bulgarian countryside. Ciao for now!